IBM Information Management System (IMS) is the IBM premier transaction and hierarchical database management system. Connectivity has always been a priority with IMS. IMS exploits the latest technologies to address customers' requirements for accessing IMS transactions and data. This IBM Redbooks publication is about IMS connectivity. 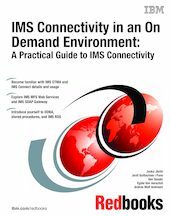 This book provides a general overview of the IMS Open Transaction Manager Access (OTMA) function and extensive information about IMS Connect and its usage, including a chapter that describes the IMS Connect Extensions product and how you can enhance the IMS Connect operating environment with it. This book provides a broad understanding of IMS Connector for Java. We cover some special considerations, such as using the conversational transactions, rerouting, and timeout support, as well as programming roll-your-own clients without using IMS Connector for Java. We also introduce Open Database Access and provide examples of using it with stored procedures and with IMS Remote Database Services. As for future directions, we also include a chapter about the IMS SOAP Gateway. This book updates and adds to the information in the previous book "IMS e-business Connectors: A Guide to IMS Connectivity," SG24-6514.